Uncle Boonmee Who Can Recall His Past Lives is a divisive film, almost provocatively light in anything you could conventionally acknowledge as plot, incident or character development. Happily I am a fan of the recent trend towards deeply decelerated Slow Cinema. Just as well really. Here’s a summary: Boonmee, close to death with collapsing kidneys, is visited by the wraith of his dead wife, and the non-human ghost monkey form of his missing son. As death approaches he takes himself off to a cave where, he remembers, the first of his incarnations was born. I understand that there was something of a backlash at the Cannes Festival this year after Uncle Boonmee won the Palme d’Or. I can dig this. It’s not Toy Story 4 by any stretch of the imagination. It’s hard to recommend to anyone who’s not acclimatized to long, meandering films that may or may not mean something. The best I can say is that my own personal thumbs remained untwiddled. The curse of the unavailable print struck again with Uncle Boonmee unfortunately. “Our” copy of the film was apparently in Köln rather than Inverness so we had to make do with a less than perfect promotional print. The PR company’s logo remained in the top right corner of the film right the way through, and we got regular onscreen prompts reminding us that we were watching a promo copy. Hey ho. 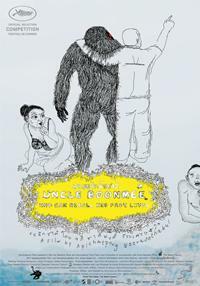 Honeymooner, my next film of the afternoon is Uncle Boonmee’s polar opposite. An indie British romance about a guy dumped just before his wedding and his two blokey-blokey male pals. I’m not a gong-banger for North London hipsterism, and my sympathy is not particularly aroused by the piffling woes of attractive, talented, wealthy twenty-somethings, but there was something beguilingly bittersweet about the movie’s candour. When you get down to it there just are not that many British films dealing maturely with men’s emotions, and it was nice to see a film whose primary concern was the feelings of its male characters. No pantomime male infantilisation here. Plenty of exploration of the duplicitous manipulative side of women though. It is a bold endeavour, and I became very engaged with writer/director Col Spector’s representation of the film in the Q&A afterwards. He talked extremely bluntly about how difficult it can be putting a film together in Britain. Kudos to him indeed for bringing this in (with huge use of deferred fees) for 43 grand. 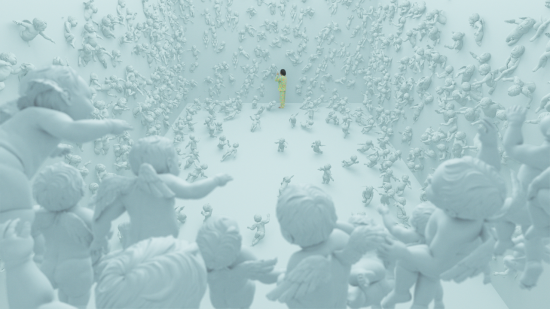 And then back to the domain of the doolally with my last film of this year’s festival Symbol, or if you prefer Shinboru, a patently ridiculous and yet deeply, deeply loveable Japanese film. In Mexico a family goes about their everyday business, cute kid, his termagant of a mother, his gentle granddad, his father who is a masked wrestler and his sister who is a chain-smoking nun. Simultaneously a Japanese man wakes up clad in clownish yellow patterned pyjamas in a featureless white room. We follow him in a bizarre Scott Pilgrim meets Tomb Raider quest to get out. These two stories are intercut despite seeming to bear no relationship to each other at all. They do converge eventually however, in a way for which the word “unexpected” seems barely sufficient. In all honesty it is completely purposeless writing about this bonkers film. I might as well do you a little dance about it. It is tremendously absorbing though and I commend it to you highly. And there ends this year’s Inverness Film Festival at which I had fun in abundance. Thanks Paul. Thanks Eden Court.